Mayor Frank G. Jackson today administered the oath of office to the first Cleveland Police Academy class to train within the Cuyahoga Community College (Tri-C®) Police Academy at the KeyBank Public Safety Training Center. The 37 patrol officers — who were sworn in during a graduation ceremony at Cleveland City Hall — will be assigned to neighborhood districts. One class member away on military leave will be sworn in at a later time, bringing the total number of new officers to 38. The recruits were selected following a Civil Service exam administered in 2017 for the patrol officer position. Candidates underwent several tests and a comprehensive background check before being offered conditional employment. The new officers received more than 1,100 hours of instruction in police tactics, criminal law, community diversity and crisis intervention training. As recruits, they received training specifically to prepare them to respond to the needs of the community. 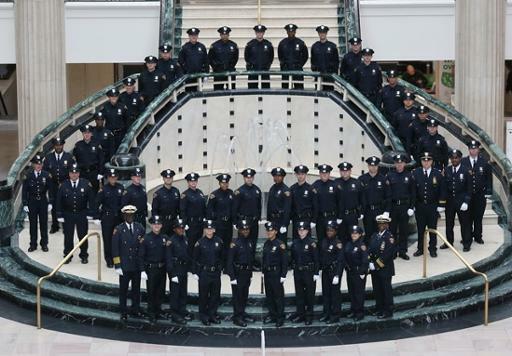 This is the city’s 141st police academy class but the first to train at Tri-C.